Please join us this Friday for Sukkot Services and/or Tot Shabbat, along with dinner in the Sukkah! Read on for details of these and more happenings. Join us for a family celebration of Shabbat geared for children ages birth through 7 and their caregivers. Our short service includes music, movement, and a story, and will be followed by pizza dinner in the Sukkah. 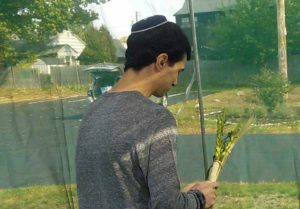 Attendees of either our Tots or regular Shabbat service are invited to come together and break bread (or split pizza), and wave the lulav and etrog, in the Sukkah. RSVP to pizza@temv.org; donations welcomed to offset costs. Parashat Vezot Habrakha. All welcome. NO Religious School this Sunday, October 23rd due to it being a holy day of Sukkot. Next Friday, October 28, 7:00pm: Simchat Torah celebration, including unrolling the entire scroll, singing and dancing with the Torah, and Consecration of our newest students. Friday, November 4, 7:00pm: New Member Service, featuring the Chelmsford UU Bell Choir. Dinner before the service at 6:00pm. Saturday morning, November 5th at 10:00am: Celebrating Our Pets: We will celebrate our dear pets on the Shabbat when we read the story of Noah and the Ark. Everyone is invited to bring their furry, scaly, or feathery family members to our lawn for a short ceremony featuring Shabbat songs and prayers and a special blessing honoring our beloved animal friends. Stuffed lovies are also welcome! Also on Nov 5, 10:30am: Shabbat morning service, and text study of Parashat Noah.